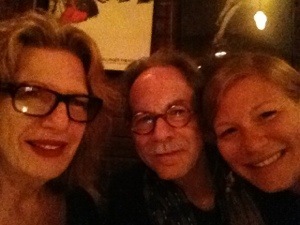 <br Our Selfie Picture (Lois, Eliot and Whitney) at Joe Allen’s restaurant last night before going to see Broadway Show, Before Midnight. Don’t miss it. a photograph that one has taken of oneself, typically one taken with a smartphone or webcam and uploaded to a social media website: occasional selfies are acceptable, but posting a new picture of yourself everyday isn’t necessary. We all like to be stroked, even if we have to promote ourselves to get it. Apparently, it is perfectly acceptable because millions of people are doing it everyday. I found the perfect gadget for people who love selfies. Audiovox just released ShutterBall, a remote control that allows you to back away up to sixty feet to take a shot of yourself, a group of people, or record videos. Priced at just $25, the ShutterBall remote is simple to use. Twist the ShutterBall to activate the battery and download the ShutterBall app to an Apple or Android phone or tablet. A mini folding stand comes with the ShutterBall for staging purposes. I just ordered one from Amazon. I was never good at taking a selfie. This should do the trick. If not, then I’m stuck with the kindness of strangers.